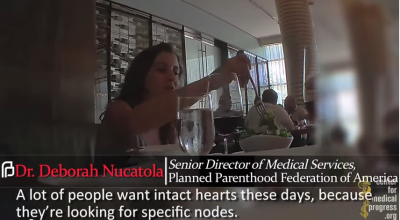 Like many others, I was horrified after watching two undercover videos in which Planned Parenthood officials nonchalantly discussed harvesting and distributing body parts of aborted babies for research. Produced by the pro-life Center for Medical Progress, these videos, one released last week and the second released this week, contain jarringly graphic descriptions of what happens during an abortion and how some abortion providers work to “save” the organs of the tiny babies they then discard. But these horrific videos once again bring home the truth: Abortion – in all of its horror – really is real. It’s not a theoretical concept, a “social” or “cultural” issue or the topic of a slogan on a bumper sticker. It’s not a war of words pitting “pro-life” and “pro-choice” sides trying to score points against each other in public campaigns, opinion polls or talk shows. No, abortion is a tragic reality that every day causes 4,000 children in this country alone to lose their lives. And Planned Parenthood, the nation’s largest abortion provider and subject of these two sickening videos, is real too. In recent days, federal and state legislators have called for investigation into whether Planned Parenthood clinics are harvesting the body parts of children for money, circumventing bans on partial-birth abortion, and selecting abortion techniques based on which body parts to “crush” and “not crush.” These investigations are important, but we must also not forget the larger, even more sickening, reality: It’s a fact that Planned Parenthood performs a third of all abortions nationwide, snuffing out the lives of hundreds of thousands of unborn children per year; it’s a fact that Planned Parenthood takes in hundreds of millions of taxpayer dollars – over a half billion per year for the last four years; it’s a fact that Planned Parenthood has seven abortion clinics right here in Virginia; and it’s a fact that, in Virginia, Planned Parenthood is fighting against current health and safety regulations on its clinics. Infinitely more important, though, is this fact: Jesus is also real, and he “came so that they might have life and have it more abundantly.” (John 10:10) This reality compels us to act: We can pray for an end to abortion; we can advocate for state and federal protections for unborn lives and an end to taxpayer funding of abortion and Planned Parenthood; we can respect the gift of life in numerous ways each day by being a life-affirming, life-giving example, persuading others with compassion and love. Every time Jesus becomes “more real” to others through the Gospel of Life we live, abortion and Planned Parenthood become less real.